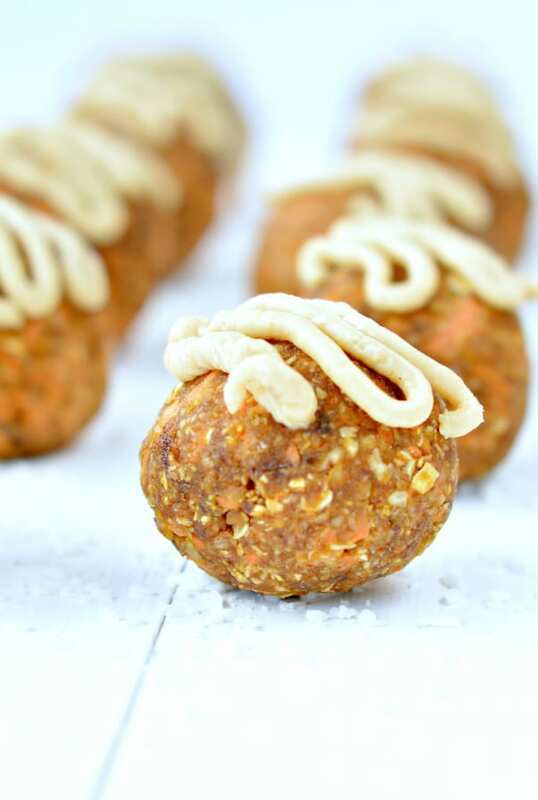 No Bake Carrot Cake Balls are the best energy bites to refuel after a work out or to indulge on carrot cake without guilt. It is one of my favorite post work out clean eating recipe. Made with only wholesome ingredients from nuts, oats and carrots those carrot bites are the healthy way to fix a carrot cake craving – they really taste like desserts! Plus, they are super easy to make – only 3 minutes in your food processor and it is ready! So don’t wait longer and jump to the recipe. I am currently training for a half marathon and eating healthy carbs and protein after a long run is essential. Those carrot cake protein balls are the perfect recovery food after a long run as it contains high protein ingredients like almond butter, cashew butter, vegan protein powder – made of quinoa and oats – and wholegrain rolled oats. I used protein cocoa powder to increase the protein intake of each balls but if you do not have protein powder you can simply use unsweetened cocoa powder.The taste is absolutely divine very similar to a carrot cake. The texture is soft and moist with lovely crunchy bites of pecan nuts and grated carrots. It is also a lovely treat for kids afternoon tea. 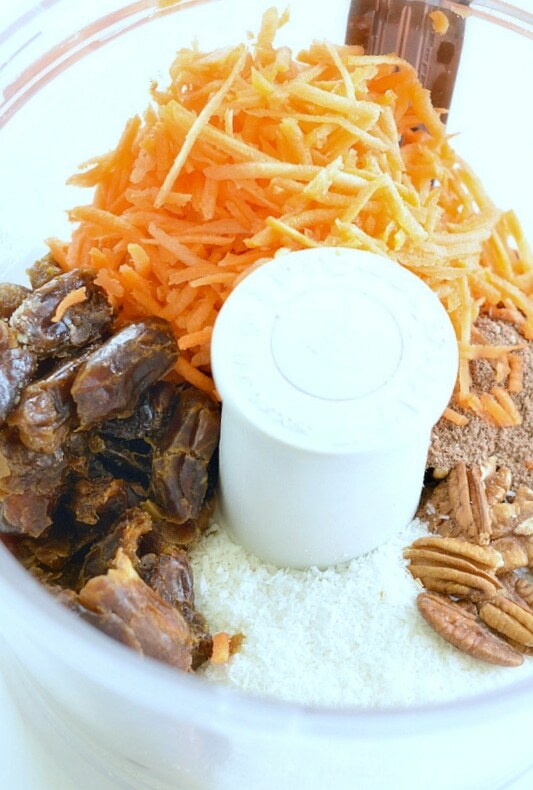 This recipe make about 20 carrot cake raw balls. It store really well in the fridge up to a week, in a airtight container or plastic box. The recipe is vegan, gluten free and refined sugar free. Dates contains lots of natural sugar so if you are diabetic it is better to use a low GI dried fruit like dried apricot. WATCH THE CARROT CAKE BALL RECIPE AND MAKE THEM NOW ! 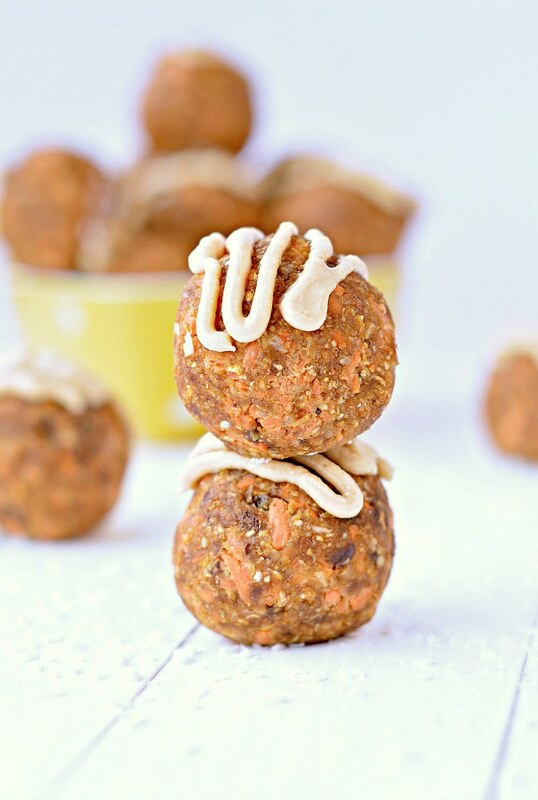 No Bake Carrot Cake Balls are the best energy bites to refuel after a work out. Loaded with nuts, oats and carrots those carrot bites taste like desserts without the guilt. In a food processor with the S blade attachment add all the ingredients except the cashew butter that you will use to drizzle on top of the balls to decorate them. Process until it comes together and form a ball. You may have to stop the food processor each 30-45 seconds to scrap down the side of the bowl with a spatula. Process again until it form a consistent raw cake batter. It should not take more than 2 or 3 minutes. Decorate. Insert the cashew butter into a pipping bag and decorate the top of each carrot cake balls with a drizzle of cashew butter. If the butter is too liquid place the butter in the fridge for few minutes until soft but not runny. Store until 2 weeks in a airtight container in the fridge. Nut butter: you can use any sort of nut butter in this recipe. I love almond butter but peanut butter works well too. Decoration: for a quick decoration simply roll the carrot cake balls into desiccated coconut and skip the cashew butter drizzle. Storage: store up to 1 month in a airtight container in the fridge. Dates: if you are using fresh and moist Medjool dates, you don't need to soak them! Soaking time is usually 5 minutes in very hot water (or boiling water for 2 minutes). Drain very well to remove the excess water before using with the other ingredient. Discard the drained water from the dates or reuse in another recipe. Hi, So sorry for that, there was an issue with the recipe plugin. 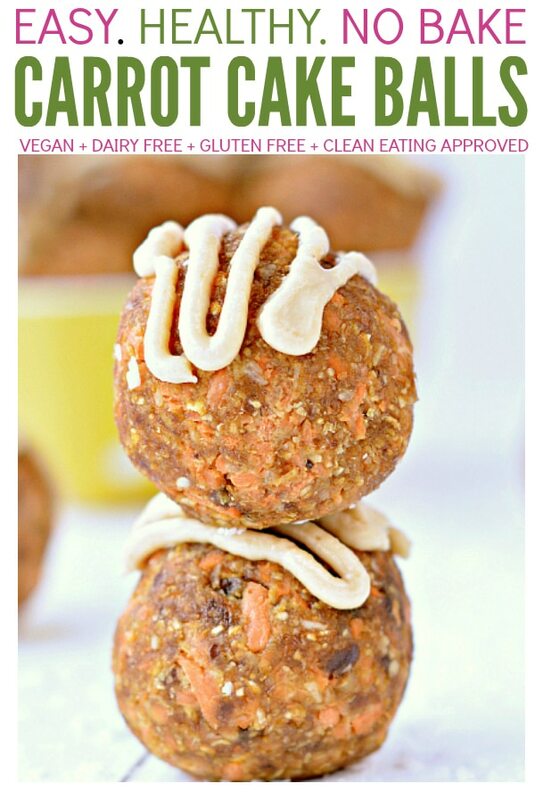 It is fixed now and you can access the lovely carrot cake protein balls recipe ! Enjoy it and thanks for reading my blog and letting me know when something is going wrong! Very helpful. xoxo, Carine. What is the calorie content per ball? Hi Kristy, I updated the recipe card for you with the nutrition panel of each carrot cake protein balls. This recipe makes 20 carrot cake balls. Nutrition facts per balls including the cashew butter frosting.Calories: 130 kcal, Fat: 8.8 g, Carbs: 11.4 g, Sugar: 5.1 g, Fibre: 1.5 g, Net carbs: 9.9 g, Net carbs: 5.8 g, Protein: 3.2 g. You can also shape smaller balls and makes 40 small balls to decrease your calories intake per snacks! Enjoy the recipe my friend! Thanks for reading the blog and trying my recipes. xoxo Carine. I made this and it was delicious. I didn’t put cocoa powder in but instead, I added a bit of ginger and cardamom. Sooo good! Such a great idea! I love ginger too. Thanks for trying my recipes and leaving such a useful comment. I will try your recipe next time I make those carrot cake balls. xoxo Carine. Could I substitute flaxseed meal for the almond meal flour? I love carrot cake and can’t wait to try theses! Hi Andrea, I am sure it will work but I often found flaxseed meal a bit bitter when used in large amount – more than 1/4 cup. I would recommend to only swap 1/4 cup almond meal by flaxseed but it is up to your taste as well. Let me know if you try it ! thanks for reading the blog and testing my recipe Andrea. xoxo Carine. For how long do I have to soak the have to soak the dates? Hi! Usually 5 minutes in hot water (or max 2 minutes in boiled water), it is perfect ! Remember to drain out the excess water before using with the other ingredients. If you are using fresh medjool dates – they are usually very soft and moist – you don’t even need to soak them! Enjoy the recipe. xoxo Carine. Is there a sub for almond meal? Hi ! Of course, you can use oat flour or hazelnut ground. Enjoy the carrot cake balls ! XOXO Carine. Can I use coconut flour instead of almond meal? I would recommend oat flour. Coconut flour contains 10 times more fibre than almond meal which means it soak up liquids in recipes very much. It will dry out the balls a lot and you may have to balance the recipe with more liquid. Let me know if you try anything different that come out tasty! XOXO Carine. Would you have any ideas on a substitution for the coconut? Sure you can use jumbo oat to add the similar texture without adding coconut ! Enjoy the recipe ! XOXO Carine. Hi any substitution for the oats? Iam eating grain free. Your recipe looks delicious! Hi Corinne, I would sub for sliced almonds or coconut chips, it will add a similar texture without the grain or carbs. Enjoy the blog recipes. XOXO Carine.